This summer I spent a month in Northern California for a residency at the Exloratorium, a museum of “art, science, and human perception”. To support the venture I received a £1000 bursary from a-n towards the travel costs of the trip. 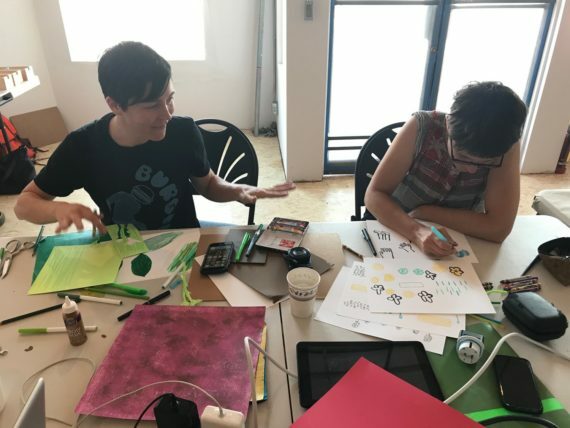 My practice is based around creative pedagogy and collaborative making, so much of the trip was dedicated to experimenting with processes and learning about how people are experimenting with these processes. This is a blog series about the trip. …I’ve been invited to go on a light walk as a lunch time thought experiment, a customary event for staff at the Exploratorium. We start the walk huddled at the edge of pier 15. Our guide arrives and looks up. He comments on the weather – it is sunny, and a good day for a light walk. We are lead down the street, and our guide confesses that he is not sure how this tour will turn out. He also lets us know that we need to find some trees. “Lets cross here”. We cross over the Embacadero and on the far side of a small car park we find some splatters of light under a row of Eucalyptus, we convene under the trees. “What do you notice?” our guide asks. 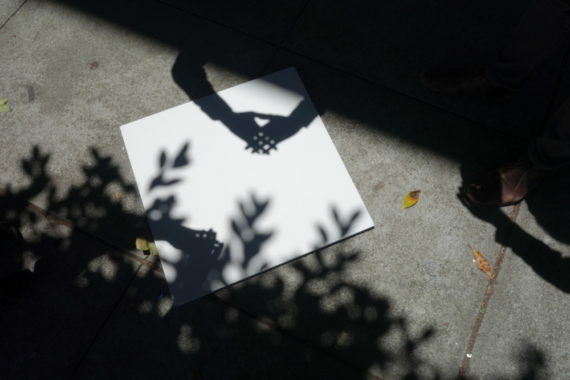 There is an…er…awkward shuffle…shadows? There is an enthusiastic shriek from our guide: yes! He rummages around a calico tote bag he is clutching, and almost as if he is performing a new trick on stage, he pulls out a large piece of card. Holding it parallel to the ground we are invited to look again. “What do you notice now?” Our guide drops the card onto the floor, “…and now?”. He pulls another prop from his tote bag. It is a magnifying glass, and on his knees he explores the light bending properties of the lens, setting the piece of card on fire. There are more props: bits of wood with holes, more card, glasses, our hands. We all have a go at light bending. I think I am starting to understand. 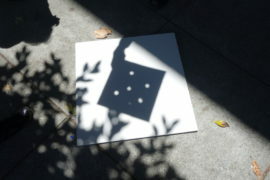 “Shadows are round because of the shape of the sun. 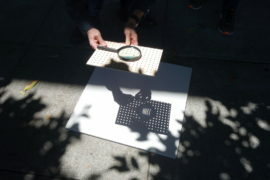 If the sun were shaped like a chicken, we’d be looking a chicken shadows right now”. It takes me a moment or two to contemplate this intriguing chicken reference, and I imagine a giant glowing ball of fire with a big beak and dangling things. I go back the studio, inspired, and thinking about chickens. 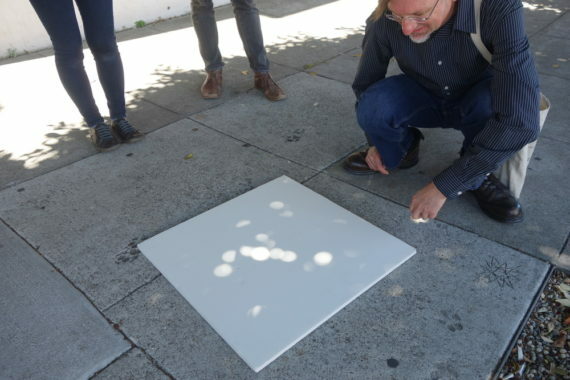 It turns out that “Light Walks” were developed by Bob Miller, an artist come scientist and long term collaborator at the Exploratotium. His exhibits documented his fascination with light, and many are still on display. My favorite is the sun painting. Two weeks later my twitter feed is full of partial eclipse shaped colanders and I am reminded again of the big chicken shaped sun. 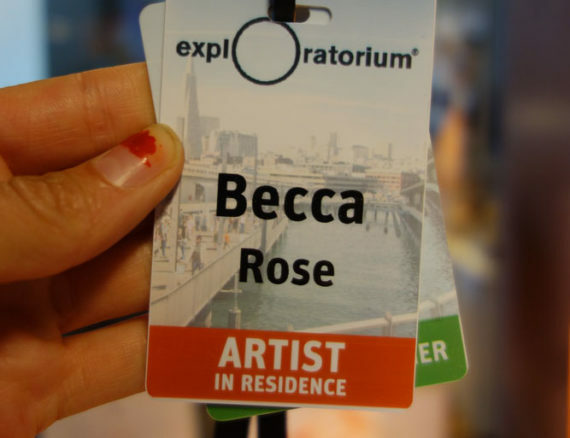 The Exploratorium is a museum of science, art, and human perception. 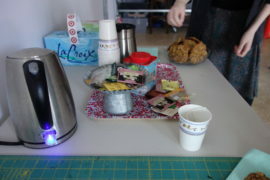 I was resident at the museum for 2 weeks in July, based at the Tinkering Studio. I learned so much from being situated in the museum. As an organization they were open and curious, and they valued and trusted people. On the first day I was given a “thinking collaborator” pass that gave me access to the museum between 8am and 8pm, I literally tagged in, directly into the hub of the museum from day 1. I was honored. I was also fascinated by their approach. An underlying educational value that the organization has is the notion that knowledge is constructed, and learning is dialogical. This was very evident in the kinds of exhibits they had on display -all (and there are many) were completed through participation. I kind of knew about this approach before I arrived, but I had not anticipated that the fabric of the museum would reflect this notion too. Just like the exhibits, and like their approach to knowledge and learning, the walls of the museum were not static. It was physically moveable: constantly changing and shifting depending on the program/artists/political/scientific/social events. Even in the short time-frame of the residency they had changed the exhibits around the tinkering studio. Sebastian moved some of the light exhibitions from another part of the museum to the space, as they fit more with the work I was making. Apparently this is very normal and all of the exhibits are designed to be moveable, so that they can be repaired of the floor in a workshop, but also so that the museum itself can play. And some of the museum is not in the museum at all. Recently they built an extension at the far side of pier, overlooking the Bay. It is designed for looking outwards. In this area there are telescopes to look out into the Bay with, and drawing prompts help you look. 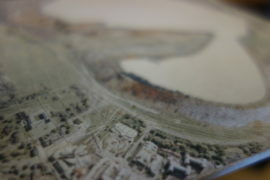 There is a museum within the museum -a small geo-socio-historical museum of San Francisco and the Bay Area. And there is documentation of the time when the museum was a walk. In 2013 Harrell Fletcher made this part of the museum into a walk to mount Diablo in the project The Best Things in Museums Are the Windows. Apart from the wonderful light exhibits, this was my favorite part of the museum to spend time in. The San Francisco Bay Area has a history of making (think Silicon Valley, microchips, VR, Elon Musk etc.). While I was in the area I had a poke around some of the spaces to make in. Not all the spaces for making are entrenched in the Silicon Valley ethos, and some (not all) are set up in opposition to some of the tensions that have arisen through the technology / consumer driven objectives that dominate a lot of the creativity in the Bay Area. On my trip I visited a few of these spaces. There are a few making spaces in the Exploratorium. The one above is part of the fabric of the museum, and run by both staff and volunteers. There is also a making space on their other pier, used to make a lot of the exhibits, and a smaller making space in the tinkering studio. I met up with a collaborator Natalie Freed, and her sister Emma who are working on a book (that is still in development process so I can’t write much about it here). We spent a day collaborating on some ideas around technology and craft at Ace Monster Toys. Natalie works in the electronics department at Pier 9, and she gave me a tour (it was only the next pier on from Exploratorium). The space is amazing. 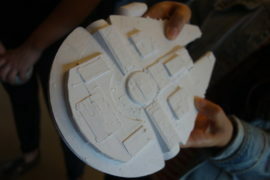 I was particularly intrigued by the “paper 3d printer”. 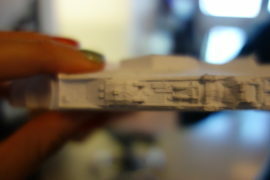 A machine that glues and cuts old stacks of paper to make 3d models. It is quite old technology (compared to some of the CNC machines on the pier), but amazing what you can make. 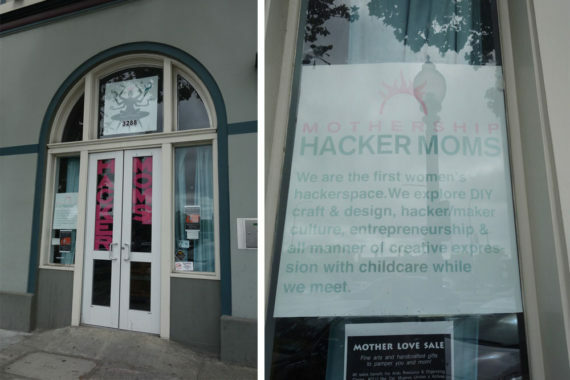 I stumbled upon Hacker Moms on while in Oakland -a space for mums who code or make or work in creative freelance work. Members pay $3 an hour for childcare while co-working in the space. 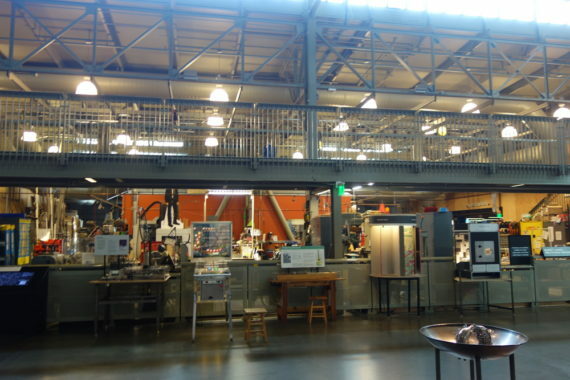 There are many more making spaces in the Bay Area that I didn’t get a chance to visit on this trip but worth mentioning here…. 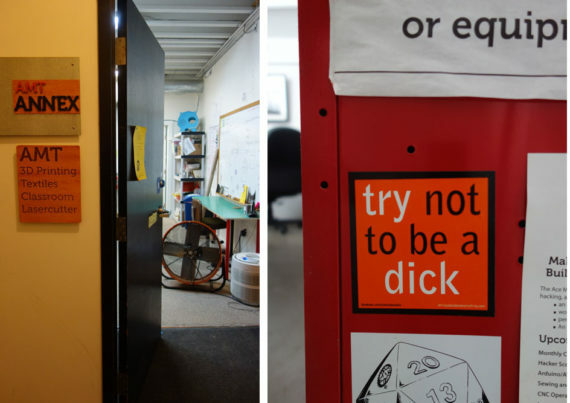 Lol is “a queer and trans people of color -centered, social justice -focused Maker Space in East Oakland”. I didn’t get to go to the space, but hope to one day. 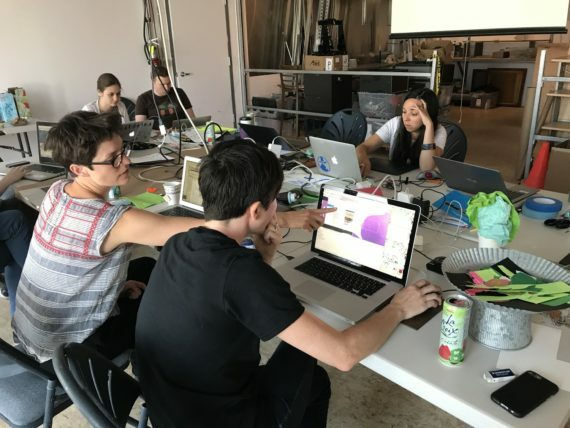 Double Union is a feminist hacker / maker space “where women can feel equally comfortable knitting, coding, drawing, or using power tools and no one feels pressure to prove they belong here”. They have a shared anti-harassment policy and a list of base assumptions for members. Creative Growth is an arts studios for artists with developmental, mental and physical disabilities. A couple of weeks before heading out the US I met up with Ryan Jenkins. We had met on twitter through our mutual interest in creative learning, and finally managed to meet in person. I mentioned the flat-game-jam that I had recently coordinated with Mark Wonnacott. Ryan loved the concept, and two weeks later on a sunny afternoon in Oakland, we are in a workshop in the Temescal district running a flat-game-jam with a group of local artists. Flat games were developed by Dreamfeel, and are kind of like a cross between ad video game and a zine. They use the video game conventions -they are made in unity3d, you control sprites and the camera view. But they depart from a video game in the way that you explore the game space without collisions, and in how ideas are expressed like they would be in a zine or comic book, they are often poetic, and tell personal stories. 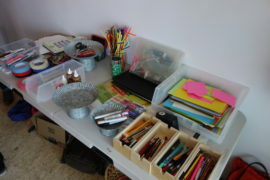 We set-up the space with craft materials. 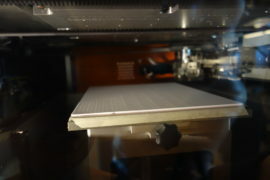 Part of the flatgame format is to make IRL before making in digital. Nicole (Ryan’s collaborator) made cookies. The session was attended by artists, game designers, and programmers, and by people who were none of those, and just wanted to play. At the end of the session we shared games by playing them of course, and then I got some really useful feedback about the process. It turns out that people really (really) liked making collisions happen, and so it would be good to adapt the format to allow for this. The group also had some ideas about how the workshop could be expanded such as into a week long session for young people. Or, there were suggestions of collaborating with a writer or poet to explore the expressive side of the format. Or collaborate with a musician. I’m hoping to run some more workshops in the UK, so the feedback was really helpful. Ryan wrote about the jam on his blog. 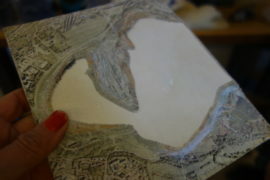 I am is artist, designer and educator based in Bristol, UK. 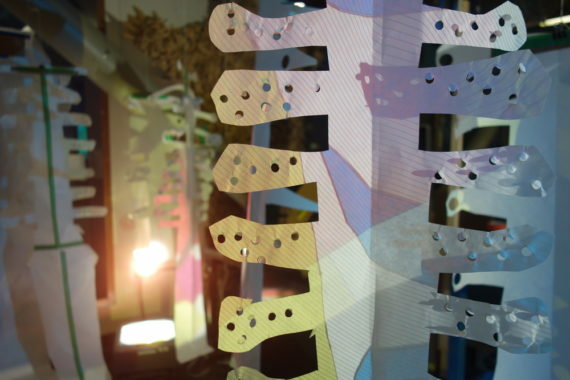 I make playful work at the intersection of folk-art, storytelling, and creative-technology. I also design and facilitate creative learning experiences.